The guys over at Very Nearly Almost have just finished the newest issue of the magazine and are set to drop issue 7 with a launch party this Thursday at Concrete Hermit. 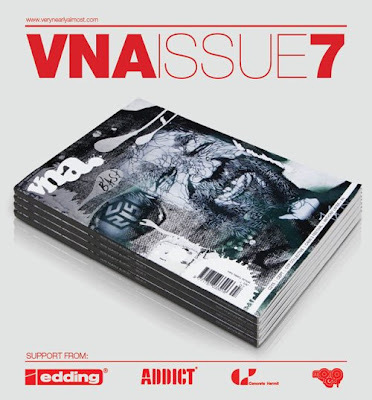 We have been fans of VNA after picking up one of the early issues last year at Stolen Space Gallery. The once black and white photo zine, has developed into a full colour perfect bound magazine over the last six issues and issue seven looks set to be the best yet with over 80 pages of full colour graffiti and street art. As well as documenting the most recent street activity in London, this new issue will include a feature on the incredible stencil work of French artist C215, an interview with London graffiti writer Cept148, a look at the recent street art in New York and a feature on the York/London crew and design collective One Trick Pony. Plus a look at what VNA believe to be one of the best street art projects of the year so far "The Chapel of St Martin" by Dave the Chimp and Nothing But Print studio.